Discount pricing is available for volume orders. Please us for pricing. EarLocks keep your earbuds in your ears. Just slip them onto your favorite set of in-ear earphones to enhance their fit dramatically. The key is EarLocks' flexible retention rings, which lock into the ear's key points in your outer ear to securely and ergonomically hold each earbud in place. The fit is carefully designed to be comfortable, and it is highly effective, keeping your earbuds exactly where you want them while you work, run, cycle, and move. Other earbuds can slip or even completely fall out of your ear, especially during exercise - but EarLocks will make sure your earphones can keep up with your active lifestyle. EarLocks come in styles to fit both Apple Earpods® and a wide variety of other circular earbuds. Choose the Earpod model for Apple earphones, or choose the Universal model to fit virtually any other round earbuds. EarLocks improve the listening experience, too! Because much of the quality of the sound you hear from your headphones depends on how efficiently the sound waves are channeled into your ear canals, EarLocks can dramatically increase the quality and fidelity of the sound your earbuds deliver. EarLocks keeps the earbuds closer to the canal openings, and stops them from bouncing around, so less sound is able to escape. And because less sound waves are lost, from the moment you put Earlocks in, the audio quality you experience goes up. The earbuds you've already been using will just sound... better. With EarLocks, you can capture the very best performance your in-ear earphones have to offer, so you can enjoy all the finer nuances of your playlists, or pick up every word of your favorite podcast. EarLocks are made with high-quality, durable material crafted for human comfort. The medical-grade polymer is hypoallergenic and never irritating to the sensitive skin of your ear canals - and it ensures that EarLocks will keep their shape and maintain their effectiveness for years to come. EarLocks are also waterproof and sweat proof (though your earbuds may not be!). 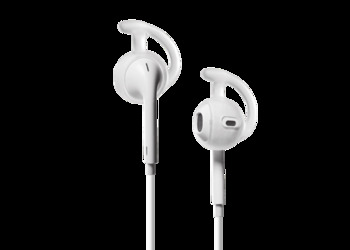 EARPODS® and APPLE EARPODS® are trademarks owned by Apple, Inc.